Our new sail line, RACER VISION XP is a Batwing™ sail made of transparent 2 ply Reinforced Monofilm (widely used for Windsurfing and Catamaran sails). This sail material has a very fine square scrim supporting the X yarns that offers superior tear strength and seam holding ability. The result is a transparent, crisp, high performance sail that has minimal stretch. Designed and cut like our popular Sport™ sails, RACER VISION XP is horizontally seamed with premium Expedition™ style sail details added to the construction of the sail. These details include radial corner patches, for better stress control and a tack hook, for ease of wingbone attachment. 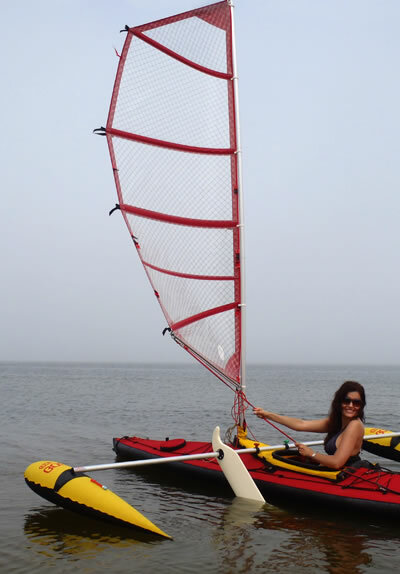 The Racer Vision XP sail comes in sizes 36 sq. ft. with 2 reefs, 32 sq. ft. with 2 reefs, 24 sq. ft. with one reef and 18 sq. ft. with one reef. This laminate sail material is transparent and the corners and seams may be in red, blue, gray, green, white or black. Pair the Racer Vision XP sail with our option of a reinforced lower mast section and you have a sail that looks great, sails well and retains it shape under more challenging sailing conditions. Upgrade any 36', 32' or 24' complete Boss™ Batwing™ Sport™ rig package to the Racer Vision XP by adding $100 to a 36', $90 to a 32', or $80 to a 24'. Questions? Call 718-548-1188 or email us - info@baloghsaildesigns.com for inquiries or price quotes on particular packages. davev@baloghsaildesigns.com website by canopy studios,inc.